In 1984, Jim Davis created an instant classic with a groundbreaking series of illustrated short stories called Garfield: His 9 Lives, setting the Fat Cat in various eras. It went on to be an animated special in 1988 with some of the most unique reimaginings of Garfield. That was then though. In the now (more specifically January) KaBOOM! 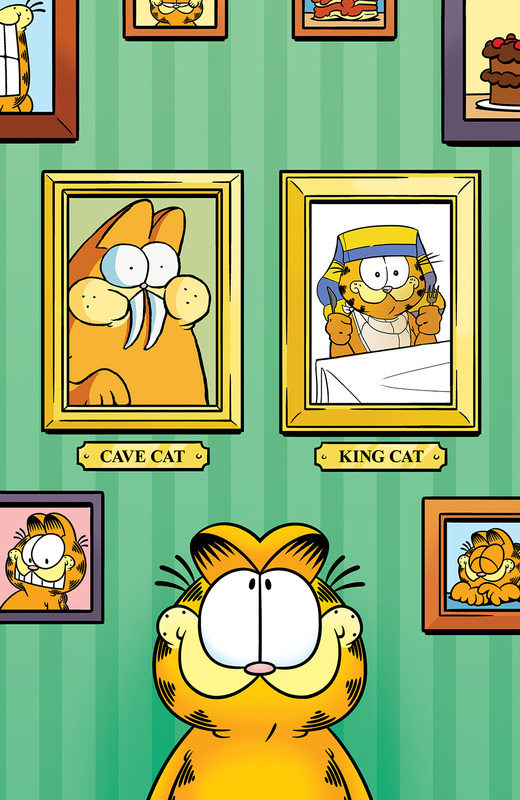 is pleased to relive this classic with a four-part event starting in Garfield #33: His 9 Lives, Part 1. The journey begins with “Cave Cat,” as David DeGrand takes readers back to Garfield’s first life, during the earliest days of life on Earth. 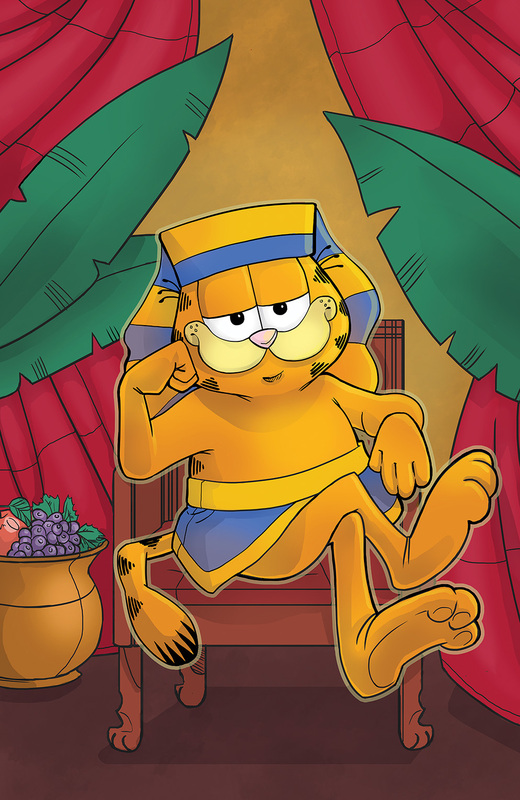 Then, Kari Smith illustrates “King Cat,” as readers see how Garfield got down in Ancient Egypt. Subsequent issues will include contributions from Frazer Irving, Andy Hirsch, Roger Langridge, Brittney Williams, Yehudi Mercado and Genevieve FT. Garfield #33: His 9 Lives, Part 1 arrives in comic shops from KaBOOM! on January 7th with a cover price of $3.99 under Diamond order code NOV141154. The main cover is illustrated by series artist Andy Hirsch, with an incentive cover by Kari Smith. The Final Order Cutoff deadline for retailers is December 15th. December 3, 2014 (Los Angeles, Calif.) - In 1984, Jim Davis created an instant classic with a groundbreaking series of illustrated short stories called Garfield: His 9 Lives, setting the Fat Cat in various eras. It went on to be an animated special in 1988 with some of the most unique reimaginings of Garfield. This January, KaBOOM!, the award-winning all-ages imprint of publisher BOOM! Studios, is pleased to relive this classic with a four-part event starting in January’s Garfield #33: His 9 Lives, Part 1. The journey begins with “Cave Cat,” as David DeGrand (Spongebob Comics) takes us back to Garfield’s first life, during the earliest days of life on Earth. Then, Kari Smith (Plume) illustrates “King Cat,” as we see how Garfield got down in Ancient Egypt. Subsequent issues will include contributions from Frazer Irving (Batman & Robin), Andy Hirsch (Garfield), Roger Langridge (Snarked), Brittney Williams (Adventure Time), Yehudi Mercado (Rocket Salvage), and Genevieve FT (Adventure Time). Garfield #33: His 9 Lives, Part 1 arrives in comic shops from KaBOOM! on January 7th with a cover price of $3.99 under Diamond order code NOV141154. The main cover is illustrated by series artist Andy Hirsch, with an incentive cover by Kari Smith. The Final Order Cutoff deadline for retailers is December 15th. Not sure where to find your nearest comic retailer? Use comicshoplocator.com or findacomicshop.com to find one! It’s also available for order directly from boom-studios.com.